I realise that this is a little late, but we’ve had other things going on since the European Podcast Award 2012 last Monday. However, whilst sitting in the Central Delivery Suite at the Doncaster Royal Infirmary waiting for the arrival of our (now 5 day old) son, we learned the outcome of our efforts to win. As you may already know, we put ourselves forward for the award in 2010, but we obviously didn’t take it particularly seriously and – as a result – didn’t get placed at all that year. 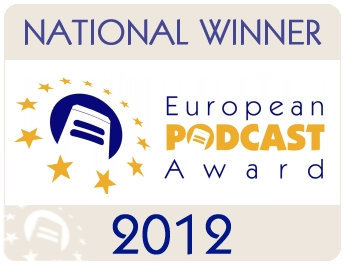 PC Podcast with Pete Cogle won the European Personality Award that year. We entered ourselves for the award again in 2011, but with a bit more intention this time, and managed to get placed in 17th place for the UK. This was a great achievement for us, and it made us determined to do better the next year. Dark Compass scooped the UK Personality Award that year. This year was different… someone else entered us for the award this year. This was such a boost for us, and we knew we had a chance, so we made sure we didn’t waste that opportunity. We promoted, we begged… everything short of deviancy, basically. The National Awards were announced first… typically, the UK was the last to be announced… but we discovered to our shock and elation that we had come first in the UK Personality Award! The European Awards were announced last… this would have been so good, but we knew we were up against the best in Europe, so – having already won the National Award – we remained pragmatic… and we came fourth in the European Personality Award! We are so grateful to everyone who has helped us get to where we are, everyone who has supported us in any way over the last 5 years. We owe this to you. Thank you.